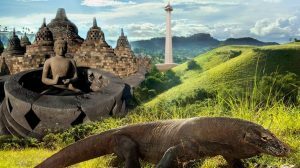 Jakarta (Indonesia) – March 26, 2019 – (travelindex.com) – Travel and tourism in Indonesia grew by 7.8% in 2018 – double the global average of 3.9, and ahead of Indonesia’s wider economy, which grew by 5.1% last year. In 2018, Travel & Tourism contributed IDR 890,428 bn (USD $62.6 billion) and nearly 13 million jobs to the Indonesian economy. One in three of all tourism jobs in the ten countries that make up South East Asia, are located in Indonesia. This makes Indonesia the third largest Travel & Tourism economy in South East Asia after Thailand and the Philippines. In total, international tourists spent nearly IDR 221,000 bn (USD $15.5 billion) in Indonesia last year, accounting for 6.8% of total exports. The largest inbound international markets were Singapore (15%); Malaysia (14%); China (13%); Australia (11%); and Japan (5%). Combined with domestic spending, Travel & Tourism supported 6.0% of the nation’s GDP in 2018. There was a remarkable increase in business spending last year, which now accounts for 30% of tourism spend in Indonesia compared to 70% leisure. WTTC President & CEO Gloria Guevara commented, “We congratulate Indonesia on the tremendous growth experienced over the last decade, and particularly in 2018, as they have strategically worked to harness the economic benefits of Travel & Tourism, which now contributes over US$60 billion to their economy, compared to US $38 billion in 2008.